This fan mister is a great addition to any outdoor space, like decks, play areas, patios, porches, poolside, and anywhere your family and friends will enjoy a cool mist in the hot summer heat. Perfect for family reunions, weddings, backyard events, etc. Helps cool your guests in the summer heat! 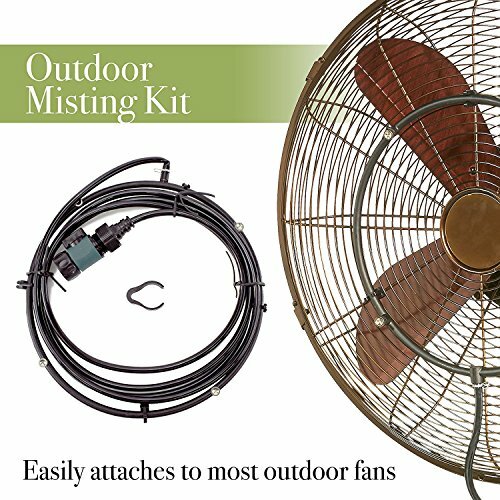 If you're at a loss as to how you can find relief from hot, muggy weather, why not try an outdoor misting kit? Misters are a great way to get cool while chilling on your patio or yard. They are easy to use and come in various sizes. Have a favorite fan already? Just add this convenient misting kit to your fan for extra fast cooling. Designer Aire's reliable outdoor misting kit is a high-quality solution for staying cool and comfortable during the hot and sticky summer months. This kit is easy to assemble and can be attached to any type of fan. Simply connect the mister to your garden hose, turn on the water, and voila! You can now enjoy the gentle, cooling mist from your fan. GENTLE, COOLING MIST: This Misting Kit creates and dispenses a fine cooling mist that will keep you cool and comfortable on hot days and nights. Attaching this mister to an oscillating fan will help deliver optimal and efficient cooling, ensuring that your pool party or backyard barbeque will enjoyed by all. EASY TO ATTACH TO YOUR GARDEN HOSE: This mister is designed to easily connect to any conventional garden hose. Start misting immediately. SATISFACTION GUARANTEED. QUICK AND SIMPLE TO USE: This is the simplest misting system around. Just attach the mister to any large fan or outdoor fan, then connect the attachment to the garden hose and enjoy the cool and refreshing air and mist from your fan. FITS MOST OUTDOOR AND LARGE FANS: At just 12" x 1" x 18", this fan mister fits most fan models perfectly. Clip on the mister and watch your ordinary fan become transformed into a misting fan. Dispenses a gentle, cooling mist. Designed for outdoor use. MADE FROM HIGH QUALITY MATERIALS: Premium product made from high-quality materials. Its compact design and neutral color fits any home decor or outside surrounding. If you have any questions about this product by Designer Aire, contact us by completing and submitting the form below. If you are looking for a specif part number, please include it with your message.